The lightweight roadster design study displays one of Honda’s core engineering principles – to design stylish and exciting cars that are also environmentally responsible. The concept for the project was ‘Clean and Dynamic’ – and this direction was followed for both the exterior and interior design, ensuring a joined-up, consistent ‘language’ between the two. One example of this can be seen at the rear of the car, where the body actually extends into the cabin between the seats. Inside, this uninterrupted, fluid approach is continued, with long sweeping curves extending from both door panels to form a frame for the instrument display. The concept for the dashboard was to avoid creating the traditional block of ‘heavy’ colour and material in front of the driver; in keeping with the clean and lightweight theme. For that reason, the dash is broken into sections, with the most important instruments in direct line-of-sight of the driver. The driver’s main controls and functions are distributed in an intuitive layout, close at hand on a panel that curves downwards to the right of the driver. A centrally-mounted semi-sequential gear-shift points towards a fun-to-drive transmission, along with paddle shifts either side of the steering wheel. Integrated into the gearshifter itself is a red ignition ‘start’ button, which reinforces the sporty direction of the car. The Honda OSM was designed by Honda’s R&D facility in Offenbach, Germany. It’s the latest example of the young talent being developed within Honda’s design studios in Europe – following the Honda Small Hybrid Sports Concept (Geneva 2007) and the Accord Tourer Concept (Frankfurt 2007). 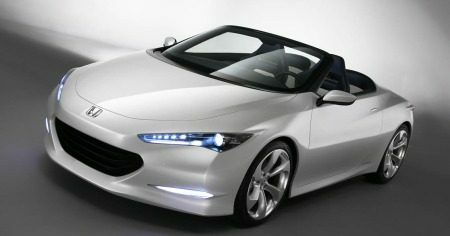 At present, the Honda OSM is a design study model, and there are no plans for it to enter production.